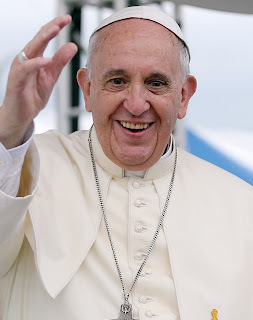 I am not a religious person, but I do admire Pope Francis and what he stands for. I was baptized a Catholic and attended Catholic elementary and high schools. As I got older I grew away from the Catholic Church over its hypocrisy and refusal to come into the modern world. To me the Church hierarchy and the clergy no longer represented the teachings of Christ. To me it was irrelevant. I felt alienated and unwanted by the Church. Shortly after Pope Francis was elected I could see a change in attitude towards former members of the Church that had previously been chastised. His attitude towards women, gays, the poor and society in general gave me hope that the Church would soon come into the modern world. I am amazed to see the throngs showing up to view his motorcade. There are people from all faiths, including Muslims and atheists who have come out to greet him. And then we hear from the American religious right! They are condemning him for speaking out in defense of the poor, the immigrants and the environment. They are condemning him for saying exactly what Jesus Christ would say if he were here today. He is being condemned for what these ignorant right wing bigots should believe if they are truly Christians. One prominent right wing minister even went on CNN to say that Catholics are not Christian and have not been since the middle ages. What rock has he been hiding under? Most of these right wingers forget that Pope Francis is the latest pope in a line of popes that date back to the first century AD. A far cry from some of these storefront churches that were found 20 or 30 years ago! The Pope is scheduled to give a speech to a joint session of Congress, which some Republican religious right members have threatened to boycott. They evidently don't like his message of love and peace and taking care of the poor. They would rather sit there and listen to a war monger like Benjamin Netanyahu! Oh how far the GOP has sunk in pandering to their base of religious bigots and their worship of the almighty dollar. Like I said before I am not a religious person, but I am truly ashamed and embarrassed by the actions of our Republican party and their so called Christian followers.